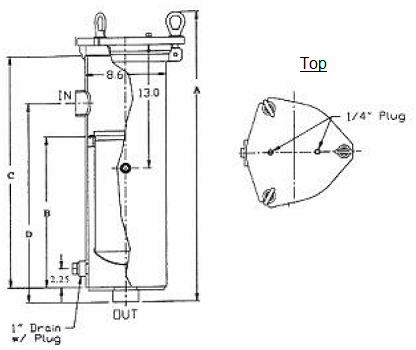 The housing has a 3-bolt swing lid closure, vent and gauge ports and two differential pressure ports to measure the differential pressure across the filter bag. Connections are 2 inch NPT with a side inlet and bottom outlet. The basket is made from 304 stainless steel with 9/64″ perforations. It can function as a strainer or a retainer for filter bags. Filter bags are available in 1, 3, 5, 10, 25 and 50 microns. The lid is sealed with a Viton O-ring. All housings are supplied with adjustable tripod legs. Maximum pressure is 100 PSI at 300º F and maximum flow rate is 180 gpm. The housing has a large sump area at the bottom of the basket for the accumulation of dirt. This means the filter operates more efficiently and prolongs the element life. Optional mesh-lined strainer baskets and O-rings are available. A vent and a gauge port in the housing lid and a drain port in the housing speed evacuation and filling. Permanently piped housings are opened with simple tools without disturbing the piping. Swing bolts with eye-nuts allow easy bag exchange. Standard finish for all vessels is 2-part epoxy. Stainless steel vessels are supplied with a satin finish.